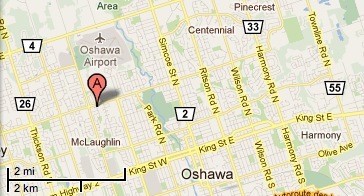 Oshawa | Laser Pointer Safety - News of aviation-related incidents, arrests, etc. An 18-year-old was arrested after a “strong” green laser strike on a Durham Regional Police helicopter, on July 29 2011. An officer on the aircraft (not the pilot) experienced “vision problems” and was examined at a local hospital. Robert Roughly was arrested at his home on Dunrobin Court in Oshawa, 60 miles northwest of Toronto. Each charge under the Aeronautics Act has a maximum fine of $100,000 and/or five years in prison.